One reason I really love Engagement pictures is because couples tell me ALL the time that they have no good pictures of the two of them together and I love getting the chance to make that happen for them! This morning I was getting some work done and decided I would check the gym schedule quickly to plan when I would get to the gym today. As I looked over the day's schedule, I noticed that a really fun step class was starting in 15 minutes. I sat and thought for a moment: Can I make it? The gym is 10 minutes away, I'm in my PJs and I haven't even brushed my teeth yet. YES! I'm going! With that, I was off, running around the house like a wind tunnel - scooping up my shoes, my sweats, my towel . . . running to fill a water bottle, throwing a toothbrush in my mouth, and (somewhat dangerously) tossing my contacts in. I ran out to my car, hopped in, and drove off! As I drove to the gym I congratulated myself for beating the clock and choosing to work out. Then I suddenly had a thought: Why does it matter? Why does it matter to me that I go to the gym. It was the first time in my WHOLE life that the answer wasn't "I want to be skinny" or "I NEED to lose weight!" The answer was simple: I want to be better. I want to be a better me. In EVERY area. I want to be healthy and strong physically, mentally, and spiritually. I want to be the BEST me I can be. And then this unfamiliar thought came to me. I've NEVER thought about it this before, so it shocked me. I want to be the best I can be so that I can stop worrying about ME. I want to take my own focus off of myself so that I can focus my attention on the needs of others. Now, it's not like I've never thought of others before. But this was different. I feel that, as girls, we are taught at a very early age to spend a lot of time and energy on ourselves. We are taught that we need to look, act, feel, smell, and talk a certain way. As teenagers, we spend SO much energy in a fruitless attempt to perfect ourselves. As young adults, we get caught up in our careers and the desire to maintain the image of having it all together. We spend SO much time working on ourselves. Well, I'm done with that. I'm tired of worrying about me all the time. I want to give myself - my time, my energy, my heart - to greater things. I think this must be what it's like to grow up. Being a gangsta baby ain't easy. The other day I shot some portraits of the insanely cute brand new baby Jude. He was so great, but my favorite thing about him was that he kept throwing gang signs and staring me down. Then he put on his hoodie. This is one bad baby - watch out world! Rebecca and Garrett have such an incredible connection. I loved watching the way the looked at each other and the subtle, quite moments of affection that they shared. As they stood together, mingling with family members, Garrett would softly place just the tips of his fingers on the back of Rebecca's neck and lovingly trace the path down the length of her arm. Rebecca would make her way to the other side of the room to greet another guest, but not without stopping to gently nuzzle her new husband's cheek on her way. Love is a wonderful thing! Here are a few of my favorite pictures from Garrett and Rebecca's awesome wedding! I actually was the assistant photographer at this particular wedding because my dear friend Kellie from Anne Marie Photography asked if I could tag along! :) I was delighted to be a part of it and I truly enjoyed every minute! I love this picture of Rebecca's mom and dad walking her down the isle. There always needs to be a funny point in every wedding - it's a must! Some of God's good light! These people were incredible dancers! MLK day has always been special to me . . . not because I claim to be deeply enlightened or righteous in any way, but because when I look at who Martin Luther King was and what it was that he stood for, it excites a place in my heart that yearns for justice, compassion, and truth. When I listen to his recorded speeches, my heart and my mind agree that the very words he spoke mirrored God's true heart for humanity. When I try to describe how deeply his words speak to me, I am at a loss. Today, as we celebrate the life of this amazing man, my prayer is that you and I would fight for freedom and justice every day of our lives. I pray that we would never become numb to the needs of those around us or blind to the places where freedom does not yet reign. My hope is that we will speak on behalf of those without a voice and that we would each find the cause for which we are called to fight. Last call, you fabulous Seniors!! Each of our 2008 contests will be geared towards a group of our loyal readers and we thought, what better way to start than with our clients?! From our wedding clients to our seniors to our fabulous families - we want to honor you! CLIENTS - We love you. We really, really do. You inspire us to do what we do and you bring us SO much joy! Thank you for sharing the most special times of your lives with us - we are honored to be a part of them!! - If you are a current OR former client of Stacy Cross Photography (weddings, seniors, family portraits, anything! ), you are eligible to enter! - Send us your FAVORITE image from your wedding or portrait session with us. Tell us WHY you love this image & how it speaks to you in 150 words or less. - The deadline to submit your picture and paragraph is February 1st, 2008 (exactly 2 weeks from today)! - I will post all of the submitted images and paragraphs by February 11th on the blog. Once they are on the blog, the fun begins! - After that blog post is created, people will have the opportunity to vote on the blog for their favorite. Now, this doesn't have to be the picture they think is the absolute best of the bunch - it can be their favorite story, moment, or even person (this is where ALLLLLLL of your family, friends and neighbors come in!) and the most votes wins! :) Voting will begin the moment the pictures are posted and will close 24 hours later. If you win, you will receive a GORGEOUS 16x20 Canvas Wrap ($200 value) of the favorite image you submitted OR another Stacy Cross Photography image of your choosing! You can apply your canvas to any past or future SCP wedding or portrait session! Remember, this contest is only open to Blog-Luvin' Clients of Stacy Cross Photography! Good luck and get writing!!! I hope you're all doing well today. :) It's so rainy and yuck here in Austin, but I'm about to brave the weather to grab some coffee and run some errands! To catch everyone up, we did some MAJOR renovations to our house this fall/winter and it looks amazing. We are soooo pleased! However, we were told it would take about three weeks and we were out of our house for over 2 months! We stayed with some incredibly gracious friends and family during that time and now we're back in the house and loving it! There's still not really a kitchen yet because none of our appliances can go back in without our counter top. The whole world is in the hands of the counter top people, but we're doing just fine right now and this gives us some time to move all of our furniture back in! Anyway, I wanted to share a few tips with you guys about trying to eat healthy in the midst of chaos. I hope this will help someone! 2) Always carry something in your pocket/purse. I found out during this last couple of weeks (the hard way) that if I ever let myself get to the "I'm starving" point, then I will eat anything and everything that crosses my path. Now, instead of letting that happen, I stick something in my purse every day - whether it be an orange, a granola bar, some prunes (personal fav), or something else, I have something I can eat if I get really really hungry. It doesn't necessarily even have to be something super low fat as long as it's a small snack and can tide you over until the next meal. 3) Chart your progress. If you guys haven't heard of it yet, I wanted to introduce you to Calorie Count. Man - this site is awesome! You can track everything from your weight loss goals to your calories consumed and your exercise on this site. It's FREE and I love it - check it out! 4) Forgive yourself. I cannot tell you how many times I used to eat something bad for lunch and then say "Oh, heck, the whole day is ruined, I might as well eat whatever I want." Then I would spend the entire following day scolding myself for such erratic behavior! :) Those days are gone. Now, if I make a bad eating decision, I just go ahead and forgive myself right away. I try to think of WHY I chose that thing and what was going on in my mind when I made that decision. I tell myself to move on and I don't let it ruin the rest of my day. I won't be controlled by food in ANY way. This has been a very important and very big change for me! What an AWESOME time we had a Marcus and Jennie's wedding! We LOOOOOOOOOOOOVE these guys (sorry if my enthusiasm for my brides and grooms is annoying to anyone - too bad - I love them!) and spending the whole day with them was just great. All I know is that the beginning of 2008 has been REALLY good to us. The two weddings we shot this month were a DREAM to be a part of and we just can't wait for more! :) Having said that, we have a month, which is kind of unheard of for us, before our next wedding! This will be a good break for me to catch back up on blogging (sorry for my negligence) so expect to hear a lot from me over the next few weeks. :) I have a couple of weddings and portrait sessions to blog so stay tuned! Anyway - back to Jennie and Marcus! Jennie and I knew each other in college through our mutual best friend, Meredith. Meredith was the maid of honor in MY wedding and last weekend, she was one of Jennie's maids of honor (she had one maid and one matron). It was very fun to see quite a few familiar faces from college! Here are a few of my favs from the day! Jennie & Marcus decided to see one another before the wedding so that they could save time between their ceremony and reception. This is a GREAT idea - feel free to email and ask me why! ; ) This is the moment when Jennie & Marcus saw each other for the first time! That's Meredith giving a toast. Isn't she lovely? :) She and Tami were fabulous maid-trons of honor together! Marcus's dance with his mom was soooooo emotional! I don't think there was a dry eye in the house! This dude was off the chain! The next couple of images are the ones I almost got kicked out of Villa Antonia for taking. I had Jennie and Marcus climb up on this cliff/wall thing that was pretty high and kind of scary. The coordinator came out in a panic (understandably) and asked that they get down. Oops. :) Well, we got what we needed! Rebecca & Garrett - Coming Soon! Just wanted to wish you all a fun weekend. :) Tomorrow we have Marcus & Jennie's wedding to shoot, but we'll also be at the Bridal Extravaganza both tomorrow and Sunday, so be sure to stop by! 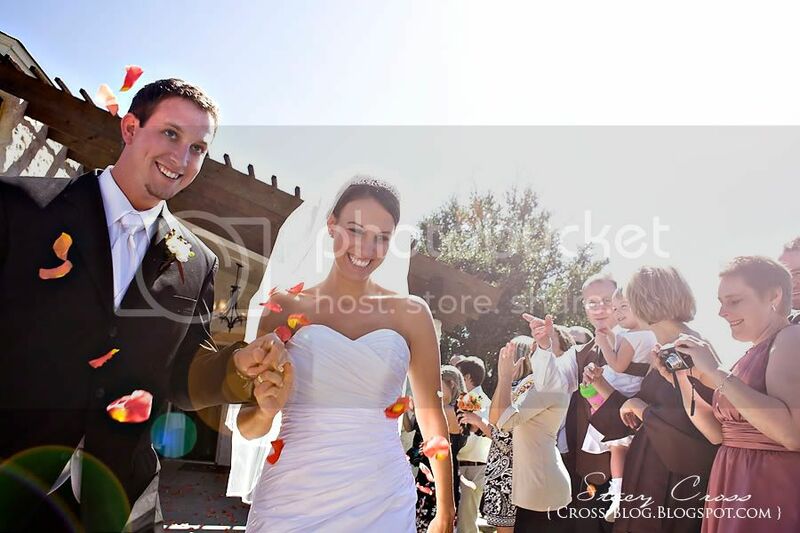 Here are just a couple of pictures from Rebecca & Garrett's wedding - more coming soon! When Tyler Schmitt asked me if I would take his family's portraits I was thrilled and so honored that he would think of me! I knew, after all, that the Schmitts are the cutest ever, so this would be really fun. Well, I had no idea that when I showed up to shoot their pictures, I would suddenly feel like I was in kindergarten, holding a camera, and having NO idea what I was doing! It's amazing how taking portraits of a professional photographer can turn you into a mushy mess. :) Somehow I got it together a got some great pictures of this beautiful family and had a really fun time with them! Here are a few of my favorites from our time together . . . Brand new baby Palmer was a hoot to shoot! As I was editing these pictures, I was trying to imagine what it would be like to have Tyler as your dad! :) All I can say is that Georgia is constantly giggling and flying around - fun! Oh my gosh. Olivia is such a great mom. She's so fun and she plays with her kids so well! She and Tyler make an incredible team! Poor Palms. Life is rough when you're forced to wear a hat with pom poms on it. Goodbye 2007, Welcome to 2008!